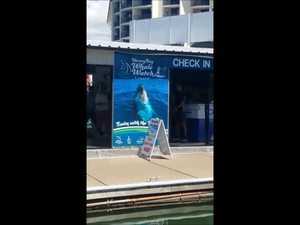 The gigantic 649kg black marlin fish was caught after a two-hour battle Thursday afternoon by Rob Crane aboard the Gold Coast based 76ft Viking Boat Too Easy. Less than 5kg off the world record, the marlin was so large it had to be winched by crane from the Gold Coast fishing crew's boat to the Urangan Slipway. News Crowds gasped in awe as the heaviest black marlin Australia has seen in more than 30 years was weighed in Hervey Bay.